The term “redhead” has been around since 1510. Ironically, although Egyptians saw red hair as a sign of misfortune — while many of their pharaohs had red hair including Ramses. Redheads have thicker hair, but fewer strands of hair. Individuals with red hair are more likely to be left handed. The United States has the highest population of redheads. Some scholars postulate that the same gene mutation that causes red hair also affects the way redheads respond to pain and anesthetics, being harder to sedate. In Denmark, it is an honor to have a redheaded child. Redheads are harder to sedate than any other group. Using most common anesthetics, they require on average about 20% more. Not all redheads are Irish. 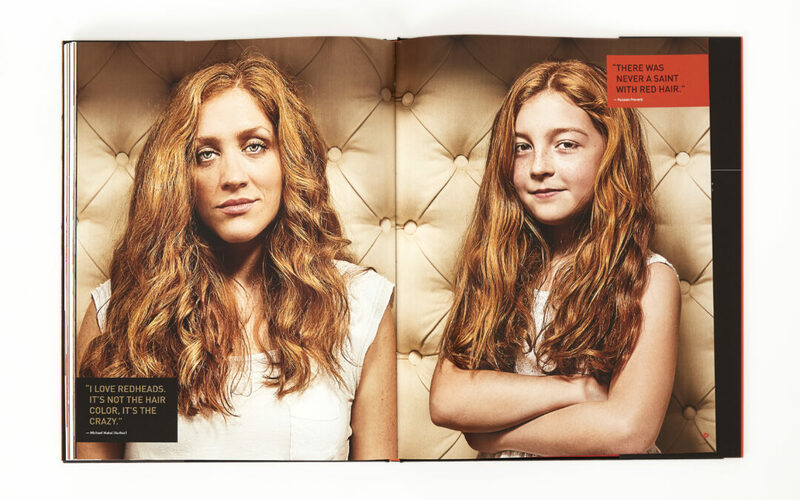 Redheads have a mutation of the MC1R gene, which causes their bodies to overproduce pheomelanin. Redheads can’t absorb sufficient Vitamin D due to low concentrations of eumelanin in their body. However, they can produce their own Vitamin D within their body when exposed to low light conditions. Red is one of the most visible colors, second only to yellow – which explains why it is used on fire engines and stop signs to trigger alertness. In ancient Rome, redheaded slaves were often more expensive than those with other hair colors. Red hair doesn’t gray as much as other hair colors. Red hair initially tends to turn blonde and then white. Red is the rarest natural hair color. Pixies have been historically pictured as redheads. Some renaissance paintings show Eve as a brunette before the fall of man and as a redhead after. People with red hair tend to have more dental-office phobias because of their resistance to pain blockers like Novocain. .Satan is often portrayed as a redhead most likely because red was viewed as the color of sexual desire and moral degradation. The Merovians of ancient Gaul were red headed and this was believed to give them magical powers. Bees are thought to sting redheads more than those with other hair colors. Thor, the god of thunder was a redhead (modern portrayal as a blonde is inaccurate). Redheads have a higher risk of Parkinson’s Disease. Ginger root has a long history of use for relieving digestive problems such as nausea, loss of appetite, motion sickness and pain. Seeing the color red can make your heart beat faster. There is a belief that redheads are prone to industrial deafness. This actually could be true as the melanocytes are found in the middle ear. According to research, it is proved that Redheads are mostly left-handed than any other hair color. During the witch hunts of the sixteenth and seventeenth centuries in Europe, many women were burned at the stake as witches simply because they had red hair. In ancient Egypt, redheads were buried alive as sacrifices to the god Osiris. “Gingerphobia” is a fear of redheads.